High-yield (junk) bonds historically have had a high correlation with stocks, and for this reason, they often serve as an early warning indicator for equity investors. In the chart below, we show 15 years of history of junk bond spreads alongside stocks. Junk bond spreads have a history of widening before stocks turn down. One of the most widely publicized memes of this cycle has been the complete lack of investment by companies around the world. Confidence is still fragile and companies are not investing like they used to, so the logic goes. Well, a look at the data reveals that this belief couldn’t be farther from the truth. We noted earlier this month that the Energy sector was far outperforming the rest of the market for most of 2014. Over the past few weeks the rest of the market has closed the gap. 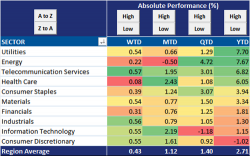 QTD Energy is still atop the leaderboard (and in 2nd place YTD), however, the dispersion between sectors has narrowed significantly. Is Gold Signaling A Move Higher in TIPS? For the last decade, TIPS yields and gold have had a negative 88% correlation. The logic is simple enough: since gold doesn’t generate any income, falling TIPS rates reduce the opportunity cost of holding gold. We can see this play out in the charts below. 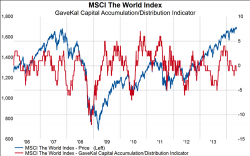 The exudes seen in bond funds last year has shown persistent signs of reversal in 2014. 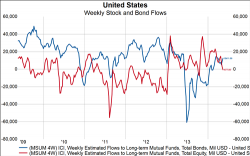 Indeed, over the last four weeks about $12.4bn flowed into bond funds (blue line). Meanwhile, equity funds, which saw positive flows throughout most of 2013 and the first few month of 2014, are now beginning to experience outflows. New home sales came in at 433K annualized in April vs Consensus of 420K. Adding to the good news is that March was revised up by 23K to 407K. Unfortunately, new home sales are still down a little over 4% year-over-year and still haven’t been able to break out above 2013 levels. The April data for NYSE Margin Debt definitely raised more than a few red flags for investors. We now have had the first 2-month consecutive drop since September 2011. 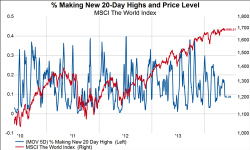 It’s no secret that we’ve been concerned about the lack of new highs in individual stocks since at least the beginning of the year. It has been a very quiet week on the US economic report front but today we finally have a string of high profile releases. We will take them in order of release times… Jobless Claims snapped back a sharp 28K jobs to 326k during the week of May 17th. One of the ways in which we can measure whether investors are in general accumulating stocks (bullish) or distributing stocks (bearish) is to track the number of days of skewed market breadth in either direction.